I’m here again, telling you about a cool sport that I knew nothing about until a couple days ago. 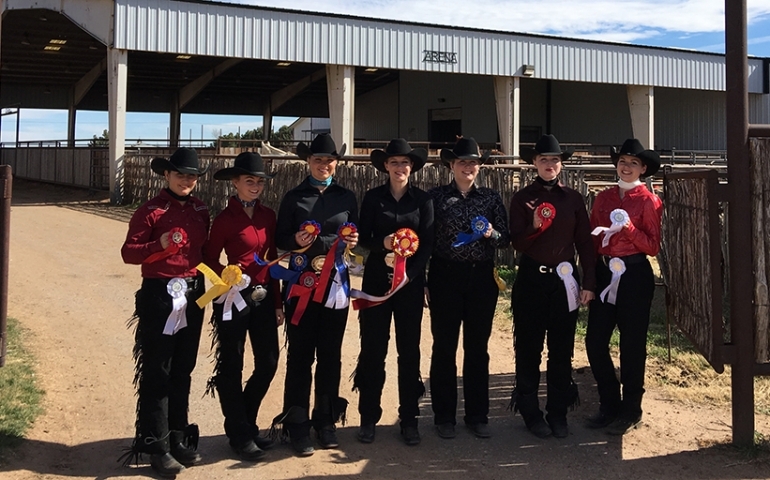 The SNU Equestrian Team, “The Storm Riders,” won Reserve High Point Team at last week’s show and took home many other individual awards. Ok. Yes. I know what you’re thinking right now. “We have an equestrian team? What does ‘equestrian’ mean? Horses are scary! Is our team actually any good? Why should I even care about the equestrian team?” OMG. Great thoughts. Great questions. Glad you asked. To be able to control a horse while having good form isn’t as easy as it looks to the average non-horse-riding person, but our SNU athletes have done exceptionally well for themselves. Taylor Fox scored the highest award possible at last week’s show, and she was competing against people who placed at the national level. All About Competitions: It’s time to stop horsing around. Let’s get serious about equestrian. There are two different categories of competing that are different in style of riding: Western and English. Within both of the different categories, there are two competitions that the riders participate in. One of the competitions is called “rail work.” This is when the riders show the horses around the arena and perform various tasks the announcer yells out. The other competition is called “pattern” for Western and “jumping” for English. This is a set series of maneuvers the rider has to take the horse through. This sport already sounds crazy and confusing, but wait there’s more! It should be kept in mind these athletes have to control a LIVE ANIMAL. “Our sport is hard because it has a brain,” explained Mia Landon, a junior. The horse’s attitude and training is just as important to the show as the rider’s attitude and training. Think of how hard this must be!! Once the riders get to a show, they draw the horse they will work with. These horses are provided by the school where they are competing. They don’t get any practice on these horses. The first time they ride them is in front of the judge! Sometimes the riders will get lucky and get a great horse, but sometimes they will get a horse that is stubborn or a wild card. I can’t even imagine as horses are scary. Scoring: The riders compete and can be awarded a first to sixth place ribbon. If a rider wins first place, seven points are awarded. Second place is five points, third is four, and so on. The points carry over for the riders into next year’s shows. Once they reach 36 points, they move up into a higher class. There are classifications of riders based on ability, from “Open” to “Beginner” in both English and Western riding. Unfortunately, there aren’t any shows close enough to the school for the students to attend, but the team is hopeful that next year they will be able to host their first show. Since the student body is not likely to be willing to drive hours to watch a show, we should give our support to the team by knowing the sport isn’t just sitting on a horse and looking pretty. Next time you see an equestrian team member, go up to them and share your newly learned equestrian knowledge.